"This book is a valuable resource for all those affected by complex PTSD, allowing them to be informed and active as partners in the therapeutic healing process." Those affected by complex PTSD commonly feel as though there is something fundamentally wrong with them-that somewhere inside there is a part of them that needs to be fixed. Though untrue, such beliefs can feel extremely real and frightening. Difficult as it may be, facing one's PTSD from unresolved childhood trauma is a brave, courageous act-and with the right guidance, healing from PTSD is possible. Clinical psychologist Dr. Arielle Schwartz has spent years helping those with C-PTSD find their way to wholeness. She also knows the territory of the healing firsthand, having walked it herself. 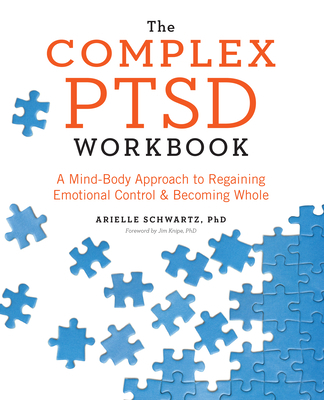 This book provides a map to the complicated, and often overwhelming, terrain of C-PTSD with Dr. Schwartz's knowledgeable guidance helping you find your way. In The Complex PTSD Workbook, you'll learn all about C-PTSD and gain valuable insight into the types of symptoms associated with unresolved childhood trauma, while applying a strength-based perspective to integrate positive beliefs and behaviors. Example] Diane was very skilled at avoiding dealing with her traumatic past. To survive, she had learned to bury her painful feelings and memories, preferring not to talk about her childhood. It simply hurt too much. Exercise] In what ways can you relate to Diane's story? Take some time to write down any associations you have. Information about common PTSD misdiagnoses such as bipolar disorder, ADHD, anxiety disorders, major depressive disorder, and substance abuse, among others. Explorations of common methods of PTSD therapy including somatic therapy, EMDR, CBT, DBT, and mind-body perspectives. Chapter takeaways that encourage thoughtful consideration and writing to explore how you feel as you review the material presented in relation to your PTSD symptoms. The Complex PTSD Workbook aims to empower you with a thorough understanding of the psychology and physiology of C-PTSD so you can make informed choices about the path to healing that is right for you and discover a life of wellness, free of C-PTSD, that used to seem just out of reach.